There’s been a long silence in this place, much longer than I liked in fact. Between work, extraordinary events and family tragedies I just couldn’t find the time to spend on the hobby – but it seems things are turning for the better. 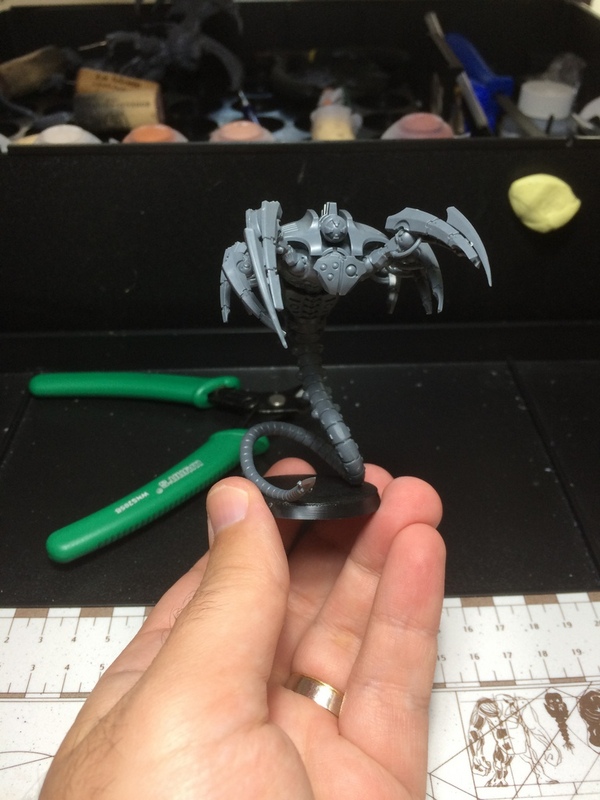 So in the little time I could scrape beginning this week I’ve put together a new model, readied for primer. Hop in to see what I’ve been up to. Since I spent the earlier Wednesday for the April Fool’s post (tell me you got it, come on), let me share the miniature work with you today. I do have some legitimate progress (although it’s not much) on a few models so hop in to see what’s been going on at the Workshop after the jump. Review and Showcase: Salt Water Arachnoid Giant (S.W.A.G.)! Welcome to my review of the Salt Water Arachnoid Giant! This is definitely one of the best kits I’ve seen in quality or complexity compared to GW and similar miniature manufacturers. Due to the awesome details and showcasing opportunities I thought it would be nice to look at it a little closer. Take a look at the details of this kit after the jump. All right! Here’s the first week of me attempting a new format with the WIP posts. When I checked back with the previous entries I saw that the pattern was getting really stale especially with additional projects popping up. Besides, I’m getting tired of setting up titles like “WIP: xxxx #1”, so I’ll try to summarize progress on the minis I’m focusing on the most (since I’m a pretty hobby butterfly and can’t keep my focus on a project for too long it seems) every week. This week I’ve also added a list that shows the entire WIP line here at once, so that could become a checklist for me. Hop in and see what fruits the past few weekends (especially the last one) bore after the jump.